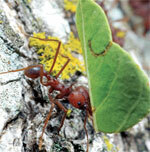 LEAFCUTTER ants are fungus farmers. They collect leaves, chew them and store the pulp to grow a garden of fungi and bacteria. The fungi act as their food and energy source. A study has now found that enzymes present in these gardens could be refined for biofuel applications. For the study, published in Applied and Environmental Microbiology on June 15, scientists used genome sequencing to identify the enzymes present in the ant gardens that convert plant biomass into energy and understand how they do it. They found that certain bacterial enzymes break down leaf polymers and help release leaf cellulose. One symbiotic fungus, Leucoagaricus gongylophorous, produces enzymes that break this cellulose into glucose subunits. These glucose subunits are consumed by the fungus to grow and produce fruiting bodies rich in fat and nutrients. It is these fruiting bodies that leafcutter ants feed on. Genome sequencing showed that the enzymes identified by the researchers are similar to known enzymes but are completely new and had never been characterised till date. The researchers believe a better understanding of these enzymes could help develop comparable methods for processing raw materials, such as corn stalks and grasses, for bioenergy production.